FIIs were net buyers of equity on all five trading days. Their total net buying was worth Rs 43.5 Billion during the week. DIIs were net buyers of equity on Wed. Apr 10 but net sellers on the other four days. Their total net selling was worth Rs 8.8 Billion, as per provisional figures. The Index of Industrial Production (IIP) in Feb ’19 grew 0.1% – the slowest since a contraction of 0.3% in Jul ’17 – due to 8.8% decline in capital goods and 0.3% decline in manufacturing. IIP was 1.4% in Jan ’19 and 6.9% in Feb ’18. India’s Consumer Price Index (CPI) based inflation rose to 2.86% in Mar ’19 from 2.57% in Feb ’19, but remained comfortably within RBI’s target of 4%. For FY 2018-19, CPI declined to 3.41% from 3.59% in FY 2017-18. After touching a new high of 39270 on Wed. Apr 3, the daily bar chart pattern of Sensex faced some expected profit booking, and pulled back towards its rising 20 day EMA. The index is consolidating sideways with a downward bias, and appears to have formed a small ‘falling wedge’ pattern from which an upward breakout is likely. Daily technical indicators are giving conflicting signals. MACD has crossed below its signal line in bullish zone. ROC is below its falling 10 day MA in neutral zone. 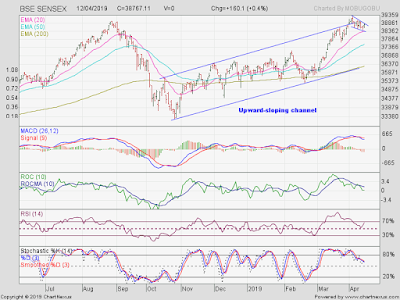 RSI is rising towards its overbought zone. Slow stochastic is falling towards its 50% level. Despite strong buying by FIIs, the index closed 95 points lower for the week. Interestingly, the index lost more than 350 points on Wed. Apr 10, even though both FIIs and DIIs were net buyers. Some more near-term consolidation is possible. The reason why many small investors lose money in the stock market is because they get caught up in bullish euphoria and enter near a market top. 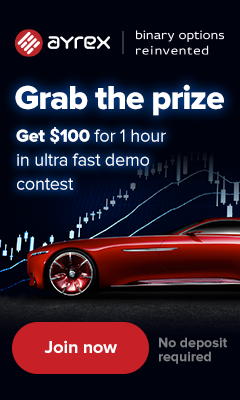 So, how does one decide whether the market will move higher or correct from here? One way is to look at the trailing 12 months (TTM) index P/E. Historically, Sensex P/E above 22 is considered ‘overbought’. Sensex P/E is above 28 now. Does that mean that the near-term index upside is limited? The answer is: Yes. FIIs are probably betting that earnings will catch up soon, and lower the P/E ratio. But if we get another quarter of tepid earnings from India Inc., FIIs may rush to the exit door. Though FIIs were strong buyers of equity, the index closed 22 points lower for the week, and pulled back to the top of the trading channel. Such pullbacks usually provide buying opportunities. The index is trading well above its weekly EMAs in a bull market. However, one should be cautious near a lifetime index high. A good look at what happened after Nifty touched its previous high in Aug ’18 should clear any doubts. Weekly technical indicators are looking bullish and overbought. 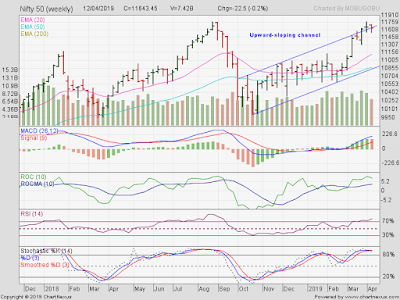 MACD is above its signal line and rising towards its overbought zone. ROC, RSI and Slow stochastic are inside their respective overbought zones. Nifty’s TTM P/E has reduced a bit to 29.06, which remains well above its long-term average in overbought zone. The breadth indicator NSE TRIN (not shown) has dropped down from the edge of its oversold zone, and can trigger near-term index upside. Bottomline? Sensex and Nifty charts are consolidating near the upper edges of their respective upward-sloping trading channels, and may face some more consolidation or correction before moving up further. Dips can be used to add.